Through the Renewable Heat Premium Payment (RHPP) scheme, financial support is available to homeowners interested in switching to a renewable heating alternative. On 1 August 2011, the Government launched the Premium Payment, the first phase of the Renewable Heat Incentive (RHI), which has been designed to encourage residential homeowners to invest in renewable heating technologies such as solar water heating. The level of support was increased in May 2013, making a one-off payment of £600/unit on offer to help with the cost of installing a solar thermal renewable heating system. The grants, available in the form of vouchers, are to be issued on a first-come, first-served basis. The Government is to make around £15 million available, which should see up to 25,000 installations of renewable heating technology eligible for the grants. The Premium Payment scheme will run from 1 August 2011 to 31 March 2014. From April 2014, anyone benefiting from the Premium Payment will then be eligible for the RHI tariff – as will those who have had eligible equipment installed since 15 July 2009. Anyone who lives in England, Scotland or Wales is entitled to apply for the Renewable Heat Premium Payment to install solar thermal panels. Unlike other technologies, it doesn’t matter how your home is heated, but to be eligible certain criteria must be met. For example, properties need to be well insulated and customers must agree to give feedback on the performance of the equipment they have installed. 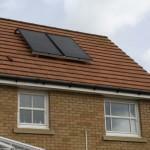 Homes will also need to have had a Green Deal assessment carried out.